* Discussions of well-established classes of onium ions, such as azonium, oxonium, sulfonium, selenonium, telluronium, and phosphonium ions. * Coverage of more recent types, from siliconium, halonium, and carbonium to carboxonium, carbosulfonium, and carbazonium ions. * Clear explanations of definition, classification, preparation, and chemistry of each major group of onium ions. * An exploration of superelectrophilic activation of onium ions through contact with superacid media. 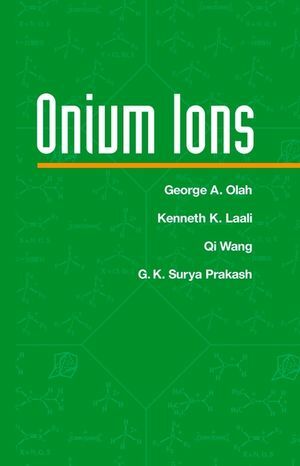 Enriched with numerous illustrations and a full listing of references for each chapter, Onium Ions should be a staple text in the professional chemist's library. GEORGE A. OLAH, PhD, was awarded the 1994 Nobel Prize in Chemistry for his work on carbocation chemistry. Professor Olah, holder of the Loker Chair in Organic Chemistry, also is Director of the Loker Hydrocarbon Research Institute at the University of Southern California. KENNETH K. LAALI, PhD, is Professor of Chemistry at Kent State University in Ohio. His research interests are in onium ions and carbocation chemistry. QI WANG, PhD, is Research Chemist at the Occidental Chemical Corporation in Buffalo, New York. His research interests are in superacid and Friedel-Crafts chemistry. G. K. SURYA PRAKASH, PhD, is Professor of Chemistry at the University of Southern California, and holds the Olah Chair in Hydrocarbon Chemistry at the Loker Hydrocarbon Research Institute. His research interests are in hydrocarbon, carbocation, and synthetic organic chemistry. Carboxonium, Carbosulfonium and Carbazonium Ions.